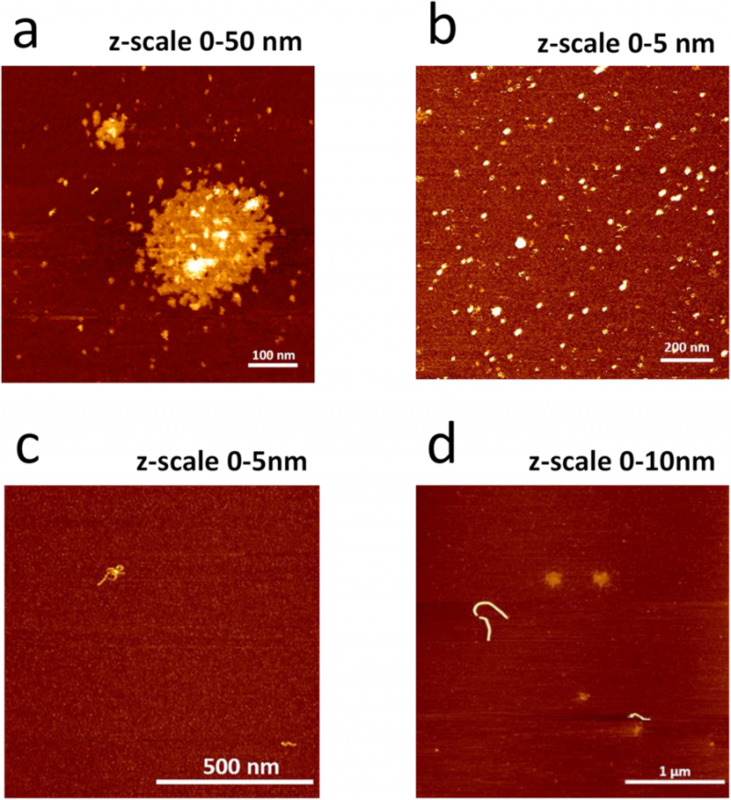 For this article the AFM images taken with tapping mode in Tris buffer solution were performed with the NANOSENSORS qp-BioAC (cantilever 3, resonance frequency 30kHz). Figure 5 from Yordanova et. al. “Zn2+-triggered self-assembly of Gonadorelin [6-D-Phe] to produce nanostructures and fibrils” – AFM image of the Zn2+: GnRH [6-D-Phe] 10:1 complex. (a,b) Oligomers after preparation with tapping mode in Tris buffer solution (c,d) fibrils with tapping mode in air (z-scale indicates the average size of the formed oligomers and fibrils). Abstract: A synthetic derivative, GnRH [6-D-Phe], stable against enzymatic degradation, self-assembles and forms nanostructures and fibrils upon a pH shift in the presence of different concentrations of Zn2+ in vitro. Attenuated Total Reflection Fourier Transform Infrared spectroscopy (ATR–FTIR) revealed the existence of higher order assembly of Zn2+: GnRH [6-D-Phe]. Nuclear Magnetic Resonance spectroscopy (NMR) indicated a weak interaction between Zn2+ and GnRH [6-D-Phe]. Atomic Force Microscopy (AFM) showed the existence of GnRH [6-D-Phe] oligomers and fibrils. Molecular Dynamic (MD) simulation of the 10:1 Zn2+: GnRH [6-D-Phe] explored the interaction and dimerization processes. In contrast to already existing short peptide fibrils, GnRH [6-D-Phe] nanostructures and fibrils form in a Tris-buffered pH environment in a controlled manner through a temperature reduction and a pH shift. The lyophilized Zn2+: GnRH [6-D-Phe] assembly was tested as a platform for the sustained delivery of GnRH [6-D-Phe] and incorporated into two different oil vehicle matrices. The in vitro release was slow and continuous over 14 days and not influenced by the oil matrix.